An anthology of modern fantasy, and an absolutely excellent collection. I loved the Ursula K. Le Guin, Orson Scott Card, and Emma Bull stories, but the dark horse contenders were Andy Duncan's "Liza and the Crazy Water Man," (a love story set during the Depression, with a mild little touch of magic) and Sherwood Smith's "Mom and Dad at the Home Front." The Smith story was a surprising take on the old trope of children who find a way to escape to a magical world and have adventures; the story is told through the point of view of their parents, who are understandably appalled that their children disappear from their beds each night. The story reminded me of the Buffy episode "The Zeppo," in which a magical apocalypse is narrowly avoided by the *background* characters, and the main story is about a normal human on the periphery of that fight. I love that stuff! Aimed at teens, and again with the whiny-people-with-trivial-problems problem occasionally (Ellen Kushner's "Charis," especially). But tons of wonderful stories.Best stories: Neil Gaiman's "Chivalry" (about an old woman who finds the Holy Grail at a secondhand store)Susan Palwick's "Jo's Hair" (about what happens to Jo March's hair when she sells it)Harry Turtledove's "Not All Wolves" (about a boy werewolf escaping into the Jews' quarter)Andy Duncan, "Liza and the Crazy Water Man" (not so much for the fantasy element, which is negligible, but for the marvelous evocation of the early days of radio and mountain music)Ursula LeGuin's "The Bones of the Earth" (about stopping the earthquake, and fathers, and teachers)Sherwood Smith's "Mom and Dad on the Home Front" (about what the parents do while the kids are saving the other world)Orson Scott Card's "Hatrack River" (about the night Alvin was born, and I'm sure I've read it in one of the novels). I picked up a copy as beach reading. The only story that I still remember from it was "Jo's Hair," by Susan Palwick. It was amazing. My rating is based on "Jo's Hair." The volume begins with Neil Gaiman's charming Chivalry, the story of Sir Galaad attempting to win the Holy Grail from an old lady who bought it from a thrift shop. It's wacky, hilarious, and a great play on mythology invading the modern world. This story is also in Smoke and Mirrors, which I already own.Charis, by Ellen Kushner, is about a human girl who lives in Bordertown, a place between the World and the Faerie realms, and her attempt to rescue an elven lord. The mixed city is the most interesting component, and though the plot itself isn't bad, there were some technical problems I had with the piece. It starts with a wandering introduction that gradually comes to the main issue at hand, and it ties up almost entirely through Charis getting talked at by her parents. Seeing more would have been nice.Jo's Hair, by Susan Palwick, is about Jo March of Little Women and the hair she shaved off to be able to send her father money. It's an interesting fiction story, but I was a little confused about which part of it made it suitable to be included in a volume of fantasy stories. It didn't seem to fit with the rest of the volume.Not All Wolves, by Harry Turtledove, was yet another case of dèja vu, as this story was also in the Yolen Werewolves collection I read about a week back. It's still a good story about a young werewolf and the different forms of persecution.Stealing God, by Debra Doyle and James D. MacDonald, was one of the better stories in this collection. It's about a Knight Templar who's investigating the theft of the Holy Grail, and it's a great supernatural detective story.Mama Gone, by Jane Yolen, is a vampire story about a mother who rises from the grave and begins to stalk her town. It wasn't bad, but I didn't much care for it.The Bone Woman, by Charles de Lint, examines an old god working in a new world to preserve endangered things before they're lost forever. It's a good story, although I wanted the narrator to be a little more directly involved rather than someone who sits on the sidelines for the majority of the story.Liza and the Crazy Water Man, by Andy Duncan, twists an old legend in with 1930's Southern style for a unique little story. It's a little hard to see the magic, but it does well as a vignette.Mom and Dad at the Home Front, by Sherewood Smith, asks the question that some fantasies beg: when all the kids go off to fantasyland for adventures, what about Mom and Dad? I wasn't entirely happy about how it wrapped up (the whole "adults can't go there" seemed a little too pat for me), but it's an interesting question.A Bird That Whistles, by Emma Bull, is another story about elves in modern day cities (well, almost modern day), but I really like what Bull does with the elf at the end.The Bones of the Earth, by Ursula K. LeGuin, is set in her Earthsea world, but it stands well enough alone. It's about an old wizard and his last apprentice, and those two characters are lovingly drawn.Hatrack River, by Olsen Scott Card, sounded far too familiar, and when I pulled out my copy of Seventh Son, I discovered this is actually the first few chapters of that novel. It works as a short story, but I had been hoping for something in addition to the Alvin Maker universe, not merely the beginning of the first book.Overall, this was a strong anthology, but I would hesitate to buy a copy simply because I own most of the stories I liked best in other anthologies. On the other hand, it's a good introduction to some of these authors, and I enjoyed the stories, even if I had read them before. Recommended. This was a pretty good collection over all. I've read a few of the stories before, specifically Chivalry and A Bird That Whistles. Both are quite good, though I wonder whether a different Neil Gaiman story might have been a better choice. There was a Bordertown story in here, and has generally been the case with stories from that shared world, I thoroughly enjoyed it. It serves as further proof that I need to track down all the Bordertown stuff sooner or later. Jo's Hair was an interesting story, but it didn't really feel like it fit here. I wouldn't really consider it fantasy, though I did still enjoy it. Not All Wolves was pretty clever, and despite the introduction claiming that these stories are up to the reader to interpret, the moral was fairly obvious. Not that that's a bad thing, in this case, since it dealt with prejudice and racism. Stealing God was very fun and I definitely want to find more of the stories featuring its modern day Templar. Mama Gone was a nice vampire story with an interesting twist to it. I'd be curious to read more stories in this world where the supernatural is so readily acknowledge in what seems to be a Wild West era setting. It was funny to see a Charles DeLint story in here so soon after reading a whole book of his work, and as with those other stories, this one did not disappoint. It was another urban mythic Newford story, and in addition to my enjoyment of the story itself, it was nice to see elements from some of the other Newford stories I've read. Liza and the Crazy Water Man was a cute story and also falls into an odd category of fantasy stories I like that mix a fantasy element with a detailed look at a profession or time period I've never given much thought to, something I quite enjoy. Mom and Dad at the Home Front was a brilliant story, exploring an aspect of portal quest stories such as Narnia that I've never given any consideration too. It's an excellent perspective twist on that classic idea. The last two stories were the only ones to really disappoint. The LeGuin story wasn't bad, and it does make me want to revisit Earthsea. In fact, it did have some clever stuff with its magic. It's just that it wasn't anywhere near as good as the others in this book. The Orson Scott Card story was similar. There was an interesting magic system on display, but a lot of the aspects of the plot and setting were uninteresting or distasteful to me. I definitely won't be looking into the fantasy series that follows on from the story. Nonetheless, I had a lot of fun reading this anthology, and as with any good anthology, it's pointed me at some new books and authors to explore. Some great stories, some that I didn't finish. The best and most memorable for me were "Jo's Hair" by Susan Palwick, which highlighted all the problems I had with Louisa May Alcott's Little Women through telling a story about what might have happened to Jo as she got older and her hair she had sold; "Chivalry" by Neil Gaiman, for the fun and cute story in which an old woman buys the Holy Grail and an Arthurian knight tries to get it from her; and "Mama Gone" by Jane Yolen, a story about a girl whose mother becomes a vampire. 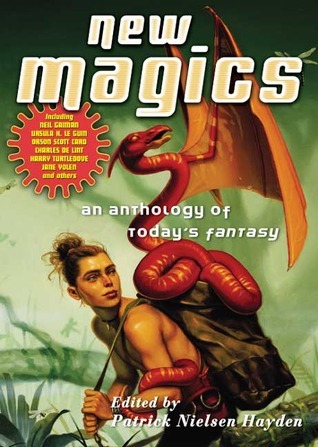 This is a stellar anthology with some old favorites (Sherwood Smith's Mom and Dad at the Homefront, Charles de Lint's The Bone Woman) and some new friends (Ellen Kushner's devestating Charis, Ursula LeGuin's The Bones of the Earth. )It's a great introduction to the wider genre for strong fantasy readers. There's a little bit in here for everyone--old school fantasy, urban fantasy, historical fantasy--different flavors and different tastes for every fantastic palate. This book is filled with stories from today's authors. I'm pretty sure the first story was one of my favorites. They are not extreme fantasy and many of them take place in modern times, or in times of history. Another good story took place during the 1930s or 1940s in Germany. Totally keeping this book around to flip through in the future . Some stories are better than others, my absolute favorite was "Hatrack River". Least enjoyed: "Mom and Dad on the Home Front." I'd been an fan of SciFi/Fantasy short stories back in highschool, this was the first book of this genre I'd picked up in at least 15 years. :-) Still entertaining, and I didn't feel nearly as silly as I'd feared I would. A nice collection of several fantasy stories. I did like this one. But I admit, I did skip through the stories that didn't appeal to me. Guilty, I know. On the other hand though, I did find stories that I really liked and wished for the rest. Overall good anthology. Some stories were a bit weak, but most were solid, although only the Le Guin tale really stood out and grabbed me. A fairly good collection of fantasy stories.Worth reading. I wish I had liked this book of short stories more. I really wanted every story to pack a punch. Hard to do though, as everyone has different taste. Patrick Nielsen Hayden Neil Gaiman Sherwood Smith Emma Bull Ursula K. Le Guin Orson Scott Card Ellen Kushner Susan Palwick - Patrick James Nielsen Hayden, often abbreviated as PNH, is an American science fiction editor, fan, fanzine publisher, essayist, reviewer, anthologist, teacher and blogger. He is a World Fantasy Award and Hugo Award winner (with nine nominations for the latter award), and is a Senior Editor and the Manager of Science Fiction at Tor Books. He changed his last name to "Nielsen Hayden" on his marriage to Teresa Nielsen (now Teresa Nielsen Hayden) in 1979.